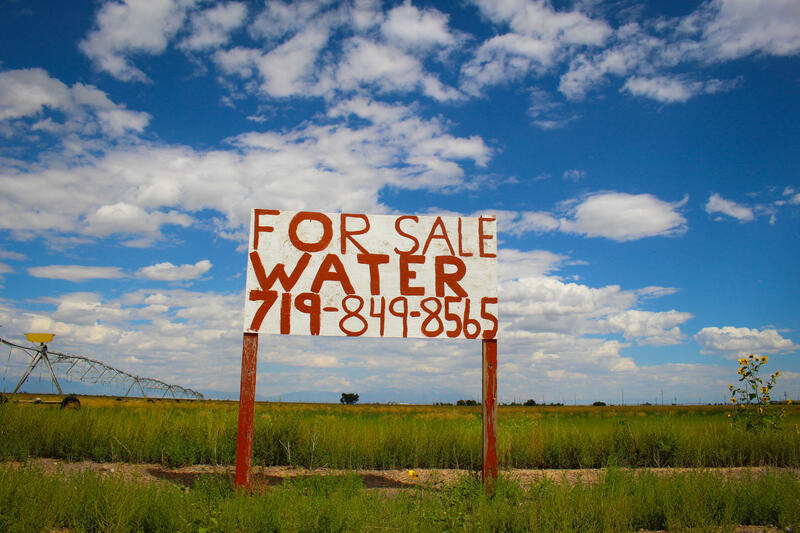 A sign advertising a water sale sits on a farm outside Del Norte, Colorado. Opting to pay extra fees for water can be expensive, says potato farmer Doug Messick, "but the big picture is you stay in business, you keep your community whole and everyone gives a little." 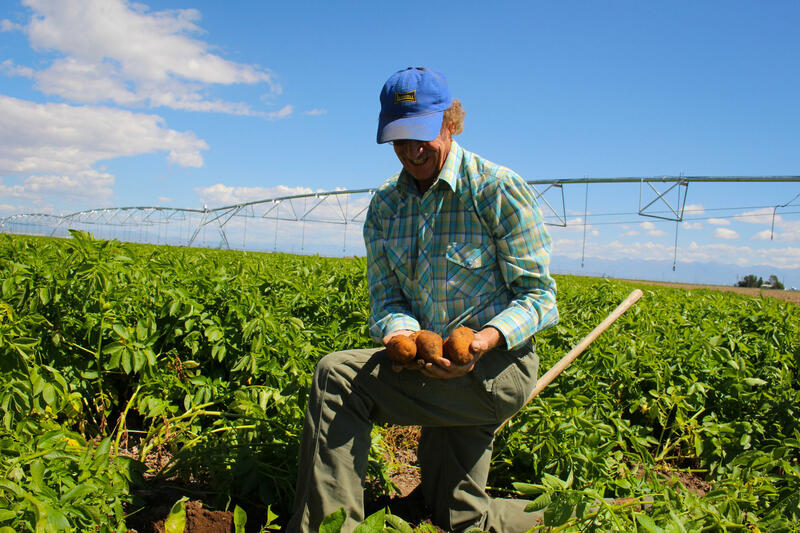 Doug Messick manages potato farms for the valley's Spud Grower Farms. This fall, his fields were full of Russets — the kind you'd use for a loaded baked potato. Hanging from a metal arm above the plants, dozens of nozzles spray down perfect little water droplets. The irrigation water keeps the fields green. Without it, this valley is just a desert. Messick pumps water from a shallow aquifer under our feet. Today there's enough to keep it running. When that epic drought started 16 years ago, "the aquifer was declining," Messick says. "But nobody really started noticing until they started sucking air instead of water back in the early 2000s." Suddenly the valley's seemingly endless supply of groundwater was gone. Neighbors argued about who was to blame. Farmers panicked. State regulators threatened to swoop in with harsh restrictions. "We couldn't sit back and just pump to the bottom of the aquifer," says Cleave Simpson, who runs the Rio Grande Water Conservation District. The lack of water would set off this horrible domino effect, Simpson says. Without water, you can't have farms. Without farms, the nearby towns suffer. Simpson recalls the thinking: "If we don't act, we might not be here. As early as the next 10 years. So it's not like something that's going to happen 100 years from now." For farmers, the options were simple. Keep pumping until everyone's water ran out. Or cut back. After years of court cases and in-fighting, Simpson says the farmers eventually made a painful decision. They agreed that to save their livelihoods, everyone had to pay more for water. "It incentivizes conservation efforts because it hits your pocketbook directly," Simpson says. For six years now, farmers have been paying more every time they turn on their pump — three or four times more. That can be tens of thousands, even hundreds of thousands of dollars each year for water. Farmers who manage some of the valley's most heavily irrigated fields end up paying $75 for every acre-foot of water that comes out of the ground, and another $8 for every acre of crops they're irrigating with the groundwater. This was the first time in the U.S. that a group of farmers did something like this — voting to tax their water use. And no one really knew if it would work. Turns out, it does: Farmers who had to pay the fees cut their water pumping by 30 percent. "We were able to determine that yes, they've been able to reduce their groundwater extraction pretty substantially," says Kelsey Cody, part of a University of Colorado research team that analyzed pumping before and after the fees went into effect. The researchers had another important finding: Those same farms aren't closing up shop because of the high cost of water. Today, the aquifer in the San Luis Valley isn't quite re-charged, but Cody says the initial results are promising. Farmers are already talking about raising their fees even higher in an attempt to cut back their pumping even further. With aquifers in danger of running dry in many communities in the Midwest and West, the San Luis Valley could provide a model, says Cody. "The reason people should care about this is that anywhere there is groundwater there is almost always going to be challenges in managing it, because it's difficult to see, it's difficult to monitor, it's easy to think that it's everlasting," he says. As for farmer Messick, he says the payoff is worth the added costs. "It seems stupid to actually tax yourselves and cost yourself more money," Messick says. "But the big picture is you stay in business, you keep your community whole and everybody gives a little." The Western United States is just starting to recover from a prolonged drought which forced residents to take a hard look at how they use water. In Southern Colorado, farmers are trying a bold experiment to do their part to conserve water. From member station KUNC, Luke Runyon reports. LUKE RUNYON, BYLINE: Colorado's San Luis Valley is a desperately dry stretch of land, about the same size as New Jersey. DOUG MESSICK: So you can see here we got our water meter. MESSICK: The aquifer was declining, but nobody really started noticing until they started sucking air instead of water back in the early 2000s. RUNYON: Suddenly, the valley's seemingly endless supply of groundwater was gone. Neighbors argued about who was to blame. Farmers panicked. State regulators threatened to swoop in with harsh restrictions. Cleave Simpson runs the Rio Grande Water Conservation District. CLEAVE SIMPSON: We couldn't sit back and just pump to the bottom of the aquifer. RUNYON: The lack of water would set off this horrible domino effect, Simpson says. Without water, you can't have farms. And without farms, the nearby towns suffer. SIMPSON: If we don't act, we might not be here as early as the next 10 years. So it's not like something that's going to happen a hundred years from now. RUNYON: For farmers, the options were simple - keep pumping until everyone's water ran out or cut back. After years of court cases and infighting, Simpson says the farmers made a painful decision. They agreed that to save their livelihoods, everyone had to pay more for water. SIMPSON: It incentivizes conservation efforts because it hits your pocketbook directly. RUNYON: For six years now, farmers have been paying more every time they turn on their pump - three or four times more. That can be tens of thousands, even hundreds of thousands of dollars each year for water. This was the first time here in the U.S. that a group of farmers did something like this, voting to tax their water use. And no one really knew if it would work. KELSEY CODY: We were able to determine that effectively, yes, they've been able to reduce their groundwater extraction pretty substantially. RUNYON: Kelsey Cody is part of a University of Colorado research team that found farmers who had to pay cut their pumping by 30 percent and with an important side note - those same farms aren't closing up shop because of the high cost. Today, the aquifer in the San Luis Valley isn't quite recharged, but Cody says the initial results are promising. CODY: Anywhere that there is groundwater, there's almost always going to be challenges in managing it because it's difficult to see. It's difficult to monitor. It's easy to think that it's everlasting. MESSICK: Oh, look there - tubers. RUNYON: Back at farmer Doug Messick's potato field, it's harvest time, which means a big payday for all his work. RUNYON: So that everybody can survive. For NPR News, I'm Luke Runyon in Colorado's San Luis Valley. Transcript provided by NPR, Copyright NPR.